There are usually two moments when primary (“baby”) teeth generate excitement in your family: when you first notice them in your child’s mouth, and when they come out (and are headed for a rendezvous with the “tooth fairy”!). Between these two moments, you might not give them much thought. But you should—although primary teeth don’t last long, they play a pivotal role in the replacing permanent teeth’s long-term health. This is because a primary tooth is a kind of guide for the permanent one under development in the gums. It serves first as a “space saver,” preventing nearby teeth from drifting into where the permanent tooth would properly erupt; and, it provides a pathway for the permanent tooth to travel during eruption. If it’s lost prematurely (from injury or, more likely, disease) the permanent tooth may erupt out of position because the other teeth have crowded the space. That’s why we try to make every reasonable effort to save a problem primary tooth. If decay, for example, has advanced deep within the tooth pulp, we may perform a modified root canal treatment to remove the diseased tissue and seal the remaining pulp from further infection. 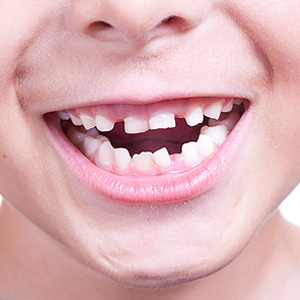 In some circumstances we may cap the tooth with a stainless steel crown (or possibly a white crown alternative) to protect the remaining structure of the tooth. Of course, even the best efforts can fall short. If the tooth must be removed, we would then consider preserving the empty space with a space maintainer. This orthodontic device usually takes the form of a metal band that’s cemented to a tooth on one side of the empty space with a stiff wire loop soldered to it that crosses the space to rest against the tooth on the other side. The wire loop prevents other teeth from crowding in, effectively “maintaining” the space for the permanent tooth. Regular dental visits, plus your child’s daily brushing and flossing, are also crucial in preventing primary teeth from an “early departure.” Keeping them for their full lifespan will help prevent problems that could impact your child’s dental health future.